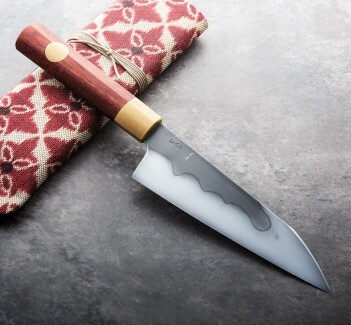 Striking grain in the hand-carved lacewoood back of this sharpening strop by Jared Jasinski doesn't just help keep your blades sharp and burr-free, it looks incredible doing it. The unique handle design which Jared created exclusively for us drops below the plane of the strop itself and provides a hand-filling, ergonomic and symmetrical grip that is easy to hold in the right or left hand. A cowhide leather strop is affixed to the lacewood and measures approximately 13.5". Jared Jasinksi carves beautiful, functional kitchen tools and accessories at his shop in northern Vermont. Growing, hunting and cooking his own food for much of his life, Jared has a keen sense of what is required functionally from the tools he creates, and an eye for design that we love. 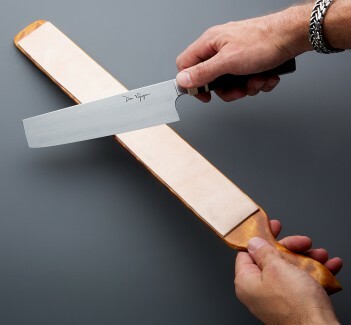 His unique, handmade wood and leather sharpening strops are an excellent example of a creative and inspiring interpretation of a simple and vital tool. Length: appx. 21". Width: appx. 1.5"